Rochester City Council member Jackie Ortiz is calling for an investigation into Alex Castro's removal as head of the Rochester Housing Authority. The RHA board voted to dismiss Castro earlier this week, and then named City Council member Adam McFadden to replace him. The switch has some people accusing the city and the RHA board of playing politics. 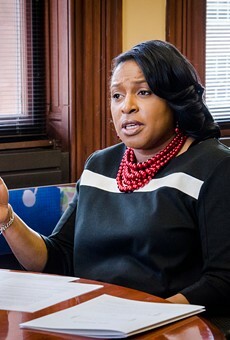 McFadden, who has long sought the RHA job, is a loyal supporter of Mayor Lovely Warren. It could also be the latest manifestation of the current fractures in the Democratic Party, which seems to be divided between supporters of David Gantt and everyone else. Gantt recently led a walkout of black Dems from the county Dems annual meeting. Ortiz, in a press release this afternoon, says that she wants "an official and thorough review" of Castro's ouster by the city's Board of Ethics and its Office of Public Integrity. She says that she's also seeking an opinion from the city's attorney. "To say that I am concerned is an understatement," Ortiz says. "What has transpired appears to have been both mismanaged and inappropriate. I look forward to receiving a through (sic) and transparent review. We owe this to the citizens of the City of Rochester." Ortiz will address the RHA board at a noon meeting on Wednesday, October 22.